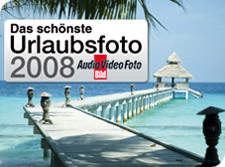 AUDIO VIDEO FOTO BILD and Photo Dose are looking for the most beautiful vacation photo of 2008. If you succeeded in capturing a great holiday snapshot, you could soon be the winner of one of many technologically attractive prizes. All you have to do: Upload your photo into one of the six competition categories after which it will be rated by other users. Besides an attractive prize, all participants enjoy honour and glory. What photographer wouldn’t like to maintain to have shot the most beautiful vacation photo of 2008? All photos will be viewed and evaluated by the users registered on computerbild.de. In order to evaluate a photo, you must be registered and logged in. Even if you haven’t submitted your own photo, you can still win a prize if you vote for the uploaded photos. You rate the photos under their respective categories with a click on the subject; on the following page you vote for the photos using a star rating system. You may upload one photo in each of the six categories every seven days. Registered users of computerbild.de will rate your photos. The category winner will be selected by the editors of AUDIO VIDEO FOTO BILD from the best pictures in each of the respective categories. Subsequently, the users vote on the overall winner of the “Most beautiful vacation photo of 2008″ contest. The winner will be announced at the beginning of November on computerbild.de. Contest closing date is Sept. 30th, 2008. In order to participate in the competition, you must first register yourself. Thereafter, you can login at any time at www.computerbild.de with the user name and password you selected during the registration process. To login, Click on “Login” at the top of the page and enter your user name and password in the appropriate text boxes. Also, please note the rules and regulations of the photo competition. A formidable share, I just given this onto a colleague who was doing slightly evaluation on this. And he in actual fact purchased me breakfast as a result of I found it for him.. smile. So let me reword that: Thnx for the deal with! But yeah Thnkx for spending the time to debate this, I really feel strongly about it and love studying more on this topic. If attainable, as you develop into expertise, would you thoughts updating your blog with extra particulars? It’s extremely helpful for me. Large thumb up for this weblog submit!